The E Shape chord is one of the most widely used barre chords. 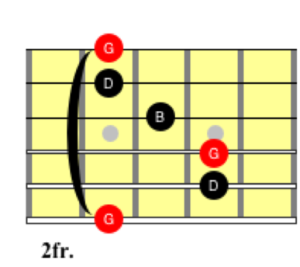 I call this an “E Shape” Chord because the shape of the chord mirrors that of an E chord in open position, but you could also refer to it as a barre chord with the root (or primary) note on the low E string. Illustrated here is the Full Form, meaning all of the notes that CAN be used for this chord in this position ARE being used. If you’ve explored playing barre chords already, then you may be familiar with this shape. You may also be familiar with a smaller version of this shape. 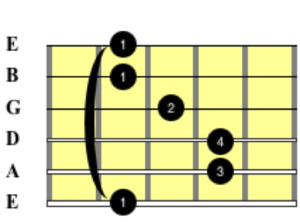 With this in mind here are various ways we could play the G chord in the same position. Keep in mind where these shapes originated – the Full E shape. This will help you retain the information and provide better context to your chord shapes. Closed voicings are when the notes are stacked as closely together as they can be. These chords will each remain within 1 octave and use 3 adjacent strings. 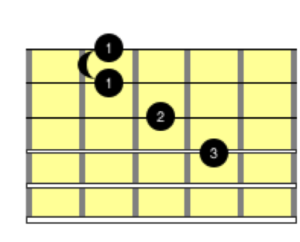 You can even stack some of the closed voiced chords together, to start building the chord back to its full form. Even though this shape is very similar to the Full Form, it will sound slightly different now that the D is the lowest note in the Chord. Open voicings can have a beautiful sound as well. 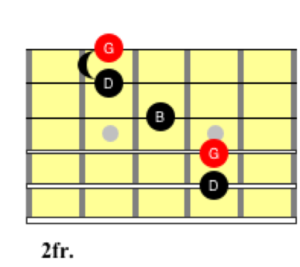 The notes of these chords spread beyond an octave and will incorporate skipped strings, so it may be easiest to play these via fingerstyle or a hybrid pick/fingerstyle. Try these shapes in various positions across your fretboard and incorporate these ideas towards other chord shapes that you may be familiar with. You may not end up using all of these shapes regularly, but hopefully exploring the different possibilities will lead you to new creative ideas in your own playing. If you found this information helpful, please share the page with others who might enjoy it. You can also support the site by purchasing Traversing the Fretboard on Amazon that covers many topics like this one. Nice lesson. Do you mean 1 B and 2 Ds? Nice catch! I’ll fix that now. Thank you!